Umbra Institute students last night enjoyed more than a hot cup of Joe. 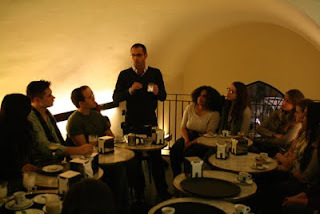 Umbra staff member Mauro Renna and history prof Zachary Nowak entertained students who participated in the Coffee Workshop, offered as part of Umbra’s extra-curricular series of food workshops. Renna and Nowak described the convoluted and often odd history of that bean which lets us start our mornings, from its domestication in Ethiopia and export from the Yemenese port of (get this!) Al-Moka, through its arrival in Venice and quick spread through Europe. History gave way to botany (Coffea arabica vs Coffee robusta, the two main species), processing, and even a little economics (coffee is the #2 most-traded product behind petroleum in dollar value). 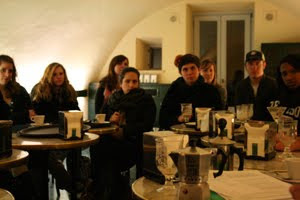 The workshop ended with a tasting of six different coffees and an explanation of their “cultural context”: Italians rarely drink cappucino after 11am, and coffee in a glass cup is considered more elegant. Renna finished up the night with a demonstration of how to us the “moka,” which in Italian refers to the Italian coffee pot, not a drink with chocolate. The next workshop is Aperitivo 101, next Tuesday!